Source: Mennonite Encyclopedia, vol. 2, photo section page 19. John Horsch: a leading historian and writer of the Mennonite Church (MC) in America; born in Giebelstadt near Würzburg, Germany, on 18 December 1867, the fourth of nine children born to Elder Jacob Horsch and his wife Barbara Landes; he married Christine Funck of Neipperg near Heilbronn, Württemberg and was the father of four children—Elizabeth (Mrs. H. S. Bender), Walter, Menno, and Paul; he died 7 October 1941 at his longtime home at Scottdale, Pennsylvania. Intended by his father to be a farmer, John studied for two years at the Bavarian State Agricultural School at Würzburg, securing the diploma in 1886. Having meanwhile come to accept the full nonresistant position he immigrated to America to avoid military service, arriving in New York 3 January 1887. January to May 1887 Horsch spent at Halstead, Kansas, attending the Indian Mission School conducted by Christian Krehbiel (to learn English), then moved to Elkhart to enter the employ of John F. Funk in the Mennonite Publishing Company, where 1887-1895, with intermittent absences to attend several colleges, he did much of the editorial work on the Herold der Wahrheit, the Familien-Kalender, and the German Sunday school quarterlies. This was the beginning of a long career of 55 years of editorial work, historical research, and historical and theological writing. During these eight years at Elkhart he also collected a large Mennonite historical library, and established a lifelong connection with the Hutterites in South Dakota. Between 1888 and 1898 Horsch spent almost four years in study in various colleges and universities (Evangelical Theological Seminary at Naperville, Illinois, Valparaiso University at Valparaiso, Indiana, Baldwin-Wallace College at Berea, Ohio, and the University of Wisconsin, Madison, Wisconsin). In 1898-1900 he engaged in a private publishing business at Elkhart, publishing the monthly Farm und Haus (first number September 1898). In 1900-1908 he was associated with J. A. Sprunger, the owner and operator of the Light and Hope Publishing Company, at Berne, Indiana, Cleveland, Ohio, and Birmingham, Ohio. Sprunger, formerly a minister in the Berne Mennonite (GCM) Church, was at this time loosely affiliated with the Missionary Church Association. In May 1908 Horsch moved to Scottdale, where he served the Mennonite Publishing House as German editor of several publications and carried on private research and writing in Mennonite history and the theological field until his death in 1941. The awakening of John Horsch's historical interest was the result of the intellectual movements in the Mennonite Church in Germany during his youth. His father had a not inconsequential library and subscribed to the two German Mennonite periodicals: the Mennonitische Blätter and the Gemeindeblatt der Mennoniten, both of which carried many historical articles in the 1880s, particularly 1885-1886. The first adequate Mennonite history in German had just appeared in 1884, written by Antje Brons. But the decisive influence on Horsch's interest in Mennonite history was the archivist and historian Ludwig Keller, with whom he continued in close touch for ten years (1885-1895), even after his immigration to America, and who directly influenced him to dedicate his life to a revival of the ancient Anabaptist principles in the Mennonite brotherhood, in spite of the fact that Keller considered the principle of nonresistance a handicap to be discarded. Keller had begun to publish his books on Anabaptist history in 1880 with a book on the Münsterites, followed by his biography of Hans Denck in 1882, and was an almost constant contributor to the Mennonitische Blätter. In his early period in America, from 20 to 30 years of age, Horsch had not altogether found himself. During this period he did publish (1890) his valuable brief history of the Mennonites in German, Kurzgefasste Geschichte der Mennoniten-Gemeinden, as well as his English booklet, The Mennonites, Their History, Faith, and Practice (1893), in addition to countless periodical articles. 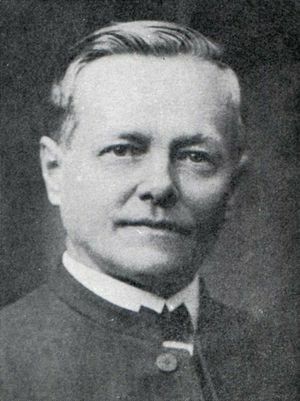 But his program of reviving the church through writing was also partially frustrated due to three factors: (1) his lack of intimate knowledge of the American Mennonite Church, its leadership, and its problems; (2) his want of a complete and independent mastery of Anabaptist history and theology and the full inner meaning of its program, due partly to the dominance of Keller's unbalanced interpretation; and (3) the difficulties with Bishop Funk and his editorial staff at Elkhart, including a disappointment with the somewhat legalistic program of the church there. The net result of the early years was disheartening, and he found no other connection by which he could effectively work for his program than that which he reluctantly surrendered at Elkhart. Nor was the connection with J. A. Sprunger a solution, for Sprunger had no vital connection with any church body, still less with any Mennonite body. Horsch's library was in Funk's hands at Elkhart, and he had no adequate stimulus to creative scholarship, although he did publish during this time his book, A Short History of Christianity (1903). But with the coming to Scottdale in 1908 Horsch found himself again. Here in the old church, he found inspiration, challenge, and opportunity. In the next 35 years he gave himself without reserve to Mennonite historical research and writing, producing a series of valuable studies: Menno Simons (1916); Infant Baptism, Its Origin Among Protestants (1927); The Principle of Nonresistance as Held by the Mennonite Church, An Historical Survey (1927); The Hutterian Brethren: A Story of Martyrdom and Loyalty, 1528-1931 (1931); and Mennonites in Europe, posthumously published in 1942. In addition many historical articles came from his pen in both scholarly and popular journals, some published in the Mennonite Quarterly Review, 1927-1940. He has the credit of discovering the modern Hutterites and their historical manuscripts and introducing them to modern scholarship, particularly to Wolkan in Vienna. He was the channel through which their large hymnal, Riedemann's Rechenschaft, and the Ehrenpreis Sendbrief were published. For a number of years, 1917-1926, Horsch was deeply stirred by the Fundamentalist-Modernist controversy in America and was drawn away somewhat from his historical studies into a position of semi-participation in this controversy. One fruit of this was the writing of an influential book called Modern Religious Liberalism, a scholarly exposé of modernism which became quite popular in Fundamentalist circles, going through three editions (1920, 1924, 1938) with a total sale of over 10,000 copies, and being used as a text in several seminaries and Bible institutes. One edition was published by the Moody Bible Institute Colportage Association. It was preceded in 1917 by a booklet, The Higher Criticism and the New Theology. In this period Horsch also assailed the milder forms of liberalism which had begun to infiltrate into American Mennonite educational circles through a few men trained in liberal seminaries, writing the pamphlets, The Mennonite Church and Modernism (1924), and Is the Mennonite Church of America Free of Modernism? (1926). Being convinced about the same time that the Mennonites of America needed a strengthening of their nonresistant position, Horsch also performed valiant work in this field through publication of booklets and articles, including the book, Die biblische Lehre von der Wehrlosigkeit (1920) which was also published in Germany, and the pamphlets, The Principle of Nonresistance as Held by the Mennonite Church and Symposium on War (1927). Horsch's writing on modernism and nonresistance, intended both to awaken the Mennonite Church (and others) and to ward off theological and historical enemies, was frequently of necessity polemic and controversial. In the last years of his life Horsch again returned fully to his first and major love, Mennonite historical writing. Having received a commission from the Mennonite General Conference to write a history of the Mennonite Church in Europe, he devoted himself to this task and succeeded in completing the manuscript in 1939 in all essentials before the final illness which cut short his career— Mennonites in Europe, which will remain his greatest monument. One of John Horsch's lasting contributions to historical scholarship was the collection of an unusually rich library on early Anabaptist history. At the age of 17 he was seeking to secure books of Hans Denck, and to the end of his life he sought to assemble the tools necessary to scholarship in a good library. The Horsch Collection, as it is now called, is especially rich in early Swiss, German, and Dutch Anabaptistica. A study of the Catalogue of the Mennonite Historical Library, prepared by Horsch and published at Scottdale in 1929, and of the final contents of the collection as it was incorporated into the Mennonite Historical Library of Goshen College in 1945, reveals its uniqueness. It was for Horsch a working collection; the many marginal notes, underlinings, and indexes of subjects and names on the flyleaves speak of his assiduous use, as do also numerous notebooks and scrapbooks filled with copious extracts; the extensive documentation of his writings with source references likewise proves his thoroughness. The gleaning in the sources which Horsch did will not need to be repeated. Horsch is best known for his outstanding work in the field of Mennonite history, by which he won wide recognition in two continents. He was a thorough and painstaking research scholar, capable of the most intensive and sustained effort in the exploitation of original sources, competent in several languages and an able and prolific writer, although he lacked formal advanced training in history. But the deepest interest and greatest passion of Horsch's life was not history, but the church, the Mennonite Church. He strove to help her to attain and maintain the ideal of a church "without spot or wrinkle," wholly devoted to her Lord. Horsch's historical interest was not merely antiquarian, nor one of pure scholarship. He found in Anabaptism the prototype of his own faith, and he sought with all his heart to revive and make effective this faith in his own Mennonite brotherhood and beyond. History was to be an instrument for evangelism in the truest and best sense. It is this frankly propagandistic strain in his writings, often with a polemical slant, that at times annoyed his readers and irritated his critics. It must be remembered, however, that the ancient perversions of Anabaptist history were still dominant and that a vigorous challenge to this historical error was necessary. Much of Horsch's brilliant energy was devoted to the fight to rehabilitate the Anabaptists in the world of scholarship. He lived to see the verdict largely reversed, a reversal to which he made no small contribution. Bender, Elizabeth H. "The Letters of Ludwig Keller to John Horsch, 1885-1893": 47-76. Bender, Harold S. "John Horsch, 1867-1941: A Biography": 3-16. Correll, Ernst. "Notes on John Horsch as a Historian": 17-22. Friedmann, Robert. "John Horsch and Ludwig Keller": 32-46. Wenger, John C. "The Theology of John Horsch": 23-31. Yoder, Edward. "A Bibliography of the Writings of John Horsch": 77-100. These materials were also issued in book form as John Horsch Memorial Papers. Scottdale, 1947. Mennonite Church USA Archives, Goshen Indiana: John Horsch Collection. Bender, Harold S. "Horsch, John (1867-1941)." Global Anabaptist Mennonite Encyclopedia Online. 1953. Web. 26 Apr 2019. http://gameo.org/index.php?title=Horsch,_John_(1867-1941)&oldid=161256. Bender, Harold S. (1953). Horsch, John (1867-1941). Global Anabaptist Mennonite Encyclopedia Online. Retrieved 26 April 2019, from http://gameo.org/index.php?title=Horsch,_John_(1867-1941)&oldid=161256. Adapted by permission of Herald Press, Harrisonburg, Virginia, from Mennonite Encyclopedia, Vol. 2, pp. 814-815. All rights reserved. This page was last modified on 28 July 2018, at 18:40.